Brivis Add On Cooling is a great way of getting a combined heating and cooling solution, all from one duct system. By placing the Brivis Ice Add On Cooler between the Heater and the first BTO, the unit is then able to use the Fan from the heater and cool it using the add-on, before dispersing the refrigerated air into your home. Have you ever begun the morning of a busy summer’s day tired, cranky and unable to concentrate because you spent the whole of last night lying in bed, staring at the ceiling, too hot and sticky to sleep? Adding cooling to your ducted heating system with an add-on refrigerated cooling upgrade gives you a complete brivis dualcomfort heating and cooling system. It will give you dual comfort all year round, in every room of your house. By using the existing ducted gas heaters ductwork, installing an add-on reverse cycle cooling system avoids the need for the material and labour costs of installing new ducts. With both units being Brivis, this allows you to use the Brivis Networkers to control both heating and air conditioning cooling. This can save you thousands of dollars. 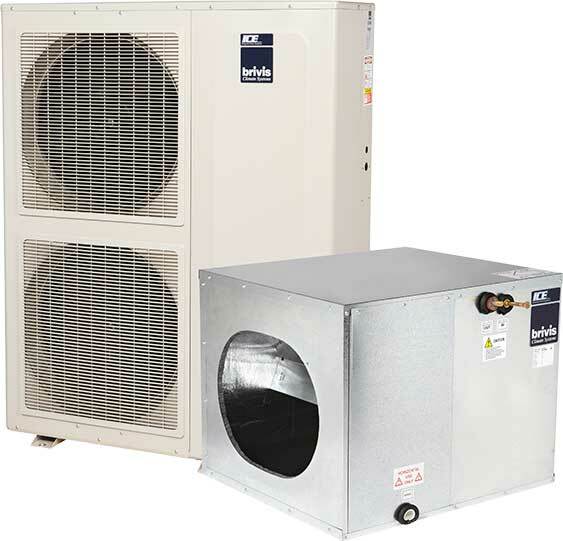 Brivis Add-on cooling systems consist of two parts: an outdoor compressor unit and an indoor unit that connects to your existing ductwork. These are discretely out of view so you’ll neither see nor hear them. They operate effectively on even very hot and very humid days, unlike Evaporative Cooling which struggles with humidity. Brivis Zoneplus Zoning allows you to split your home up into zones which can be turned on or off, depending on whether you need to use them. This helps rein in your electricity bill, and be a little kinder to the planet. Depending on the heating system you have currently, and the add-on cooling upgrade you select, you may be able to control both heating and cooling from a single panel. Please be aware that not all heating ducts are suited for an add-on cooling upgrade. Our customer service staff will be able to help you with this. Every domestic add-on cooling system installation by Plum Heating and Cooling comes with a 5 year parts and labour warranty, along with a 6 year Electrical & Plumbing Connection Warranty. To find out more about adding cooling to your ducted heating system, drop in to our showroom, give us a call on (03) 8360 9622, or get in touch with us via our contact form.